In the RAN we all reckoned we didn't need ID Cards and Official Numbers because everyone knew each other. Perhaps that's why we had ID Cards like this. This ID Card was phased out in the late seventies and early eighties. This piece of light cardboard was kept in a plastic wallet, open at one end and was certainly not waterproof. Actually it wasn't anything proof! Consequently some sailors went through heaps of them. When one was buggered you just went to the Ships Office and got the Writer to make up another for you. Bring your own photo! In 1974 my mate AB Weapons Mechanic Tony Newlands removed the official photo from his ID Card, which was permitted to be black and white only, and replaced it with his own colour photo of him with his head down, asleep in a very large beer stein in Japan. He maintained this for nearly a year until at last an observant British Army Red Cap in Hong Kong finally took a close look at it after arresting him in Wanchai one night. Remarkable, considering every 2nd Thursday (pay day) one had to step forward and salute the payment witnessing officer with the right hand, hold your ID card up to his face with the left, and recite the last three numbers of your official number. An entourage of 'crushers' (Naval Police) would always be there too. So thats how much attention people pay to ID cards. For sheer convenience it was great. You could alter name, rank, photo, birthdate at will, all you needed was an eraser and ball point pen. Bob's card above is a perfect example of a do-it-yourself. card, and this was certainly more the norm than anything else. The Marines and US Armed Forces Police never ceased to be amazed at the insecure, 'basicness' of them and placed no credence upon them whatsoever. I admit I did get caught altering the date on mine on one occasion when I was seventeen so as to enable me to gain entry into licensed establishments where the legal age was 18. I was 'trooped' of course. (Above) A typical R.A.N. 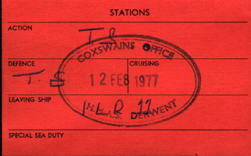 'Short Leave Card' or 'Watch and Station Card'. issued to every Junior Sailor on joining a ship or establishment. 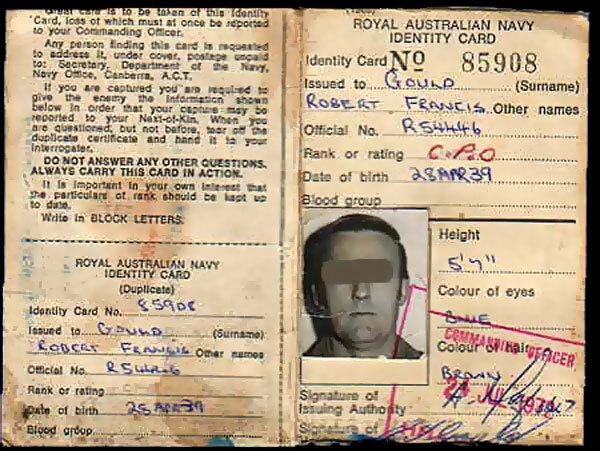 This contained the Sailor's Name, Personal Number, Rank, Messdeck Accommodation and his various stations (Action & Defence), Liferaft Number and Leaving Ship Station, Watch and Employment. 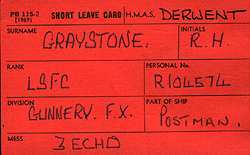 he was required to hand this card in to the Quartermaster at the gangway when proceeding ashore on liberty (Short leave -not long leave) so as to enable a record of who was ashore at any given time. When returning on board the sailor was to collect his card from the QM. At the time liberty expired for all sailors (generally 0750 the next morning for Junior Sailors) the Ship's Coxswain would go to the gangway and check to see if any cards were still in 'the box' thus registering them as being adrift and entering the details of the adrift sailor into the Gangway Incident Book. It was also required to be submitted so as to obtain a 'Beer Issue', sailors under the legal drinking age of 18 would have a line crossed through their card. Sailors undergoing punishment or 'Stoppage of Leave' would have this card confiscated, thus preventing them from leaving the ship on short leave or drawing a beer issue.. 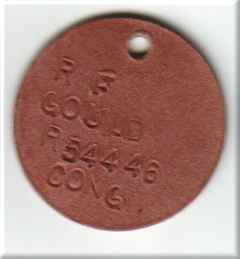 This was the pass issued to sailors proceeding on long leave or furlough and was to be carried at all times in case of being stopped by the Naval or Civil Police. Instructions on the back of the Pass were procedures for reporting sick on shore, applying for extensions, and loss of travel warrants etc. Note the '200 Cigarette Stamp. Sailors on seagoing ship's were entitled to purchase Customs Excise Free smokes ("duty frees") and were allowed to land 30 cigarettes per day or 200 hundred cigarettes when proceeding on long leave.